If you have just landed in Sri Lanka and want to go on a road trip, or you have been here a while and the need has arisen for you to drive or rent a vehicle – you have come to the right place! 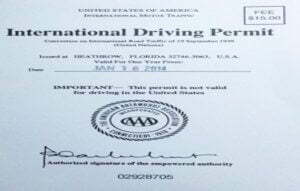 Getting a driving permit in Sri Lanka is relatively easy; there are two main options when getting it yourself as listed below. Sri Lanka is one of the few countries that requires you to get your license verified in-country before you can drive. This means, driving on an IDP or foreign national license is illegal in Sri Lanka. You need to get your non Sri Lankan license “verified” in Sri Lanka before you can drive. If you are looking for information on a regular Sri Lankan driving license (same as for a local Sri Lankan), You’ll have to look elsewhere! the permit that you get in your own country before travelling abroad usually at an Automobile association (eg. The Automobile Association of America). the license available to resident or tourists with over 6 months on their visa and is the same license that a local Sri Lankan would obtain. The following is a summary of each option you have with the IDP (1) vs country-of-origin driving license (2). Further details are given in their relevant subsections (1) and (2) below this table. 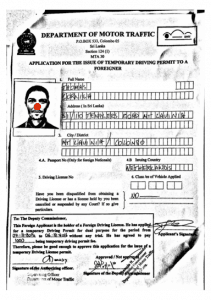 An international driving permit is often obtained from automobile companies in your home country, and looks similar to the one shown in the following picture. 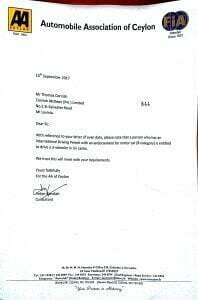 If you have an international driving permit you can obtain a 1yr driving license in Sri Lanka by presenting the following to the Automobile Association of Ceylon located in Colombo (link to google map). Bring your: Passport, drivers license and visa just in case! The permit will allow you to drive vehicles as listed on your IDP, and within the surrounding documentation as provided by your IDP. If you’re still in your home-country, you should apply at your local motoring agency for an IDP. We found that this is the only IDP which is issued by an online agent which is accepted by the AAC in Sri Lanka! If you are able to drive a motorcycle in your own country, it will be listed and covered under the IDP as “Type A”. If you have an IDP that has an endorsement for cars (Type B), the AAC will write “3WHEEL” specifically onto you license. Just remember to ask if you go in and do it yourself! In other countries this is covered under Type A, and the IDP even states “three wheel” under Type A… we know. The Automobile Association of Ceylon gives a tuktuk license if you have a Type B (car) endorsement. If you don’t have an IDP, you can still get permission to drive in Sri Lanka for up to 6 months depending on your visa. This option is relatively straight forward, and is also cheaper than the aforementioned IDP. This option will take around 30 minutes after you get to the DMT, but the traffic and distance from Colombo means it will take minimum 3 hours overall, and can take up to a full day. Please note the DMT does not issue a licence to drive a tuktuk! Please contact us if you need more information about this, as there are ways to get you a AAC approved licence without having an IDP. If you have <15 days on your visa, you will also require 2 passport size photographs! Note: if you forget the photocopies there is a photocopy centre outside! To drive a motorcycle you need a specific A type license on your national license to get approval (see section 3 for further information). Unfortunately at the DMT you cannot get a license to drive a tuktuk. The only way is with an IDP and through the AAC. 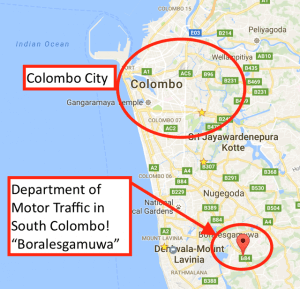 There are two different Department of Motor Traffic (DMT) offices in Colombo. One is in the city itself, and the larger one (the one you NEED) is located in BORALESGAMUWA – link to google map. As shown on the following map, it is located inland of Mt Lavinia, in South Colombo. You will need to head to counter H, which is located near the back of the centre. Walk past all of the people doing their driving tests and waiting for their medical, and through another security gate. There is a specific counter for Temporary Driving Licenses for foreigners, counter 1, and the wait shouldn’t be too long because of this. You will have to fill out the application form they provide you, hand over your documentation (license, visa etc) and the whole process takes about 15 minutes. If you have a visa with less than 15 days remaining, you can still obtain a temporary driving license though you will need to go to counter 39, which is outside section H. It might be easier to go to counter H first, and then be redirected. The following image presents is a list of vehicular permits for Sri Lanka. 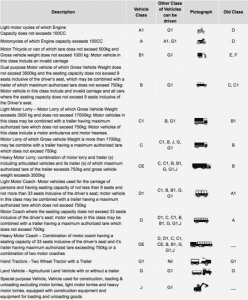 List of vehicle types and associated licenses for Sri Lanka. Hi, I’m Andrew. I’ll be heading to Sri Lanka on 15-26 July 2017 and I’m planning to rent a motorcycle. I saw your guides on getting a permit to ride there. I personally have both my own country’s license and IDP. From your guide, option 2 is cheaper than option 1. But i read that option 2 actually is quite time consuming and may need to offer bribes to the Dept of Motor Traffic officers. So is option 1 more recommended, although it’s slightly more expensive, less hassle? Thanks for your question! Despite what you might here, you shouldn’t have to (nor should you) pay a bribe to get your local driving permit. If you do have an IDP already, then yes, option 1 will be easier. Hey Andrew, option 2 is definitely cheaper. You don’t however have to pay any bribes it’s really straight forward. The only issue is the office is a bit far out of Colombo but I imagine you could do it in <3 hours from when you leave Colombo to when you get back -- HIGHLY dependent upon traffic. If you have a motorcycle license on your regular driver license they will issue you a motorcycle license. Thanks, Tom. Hi Richard, thanks for the reply. 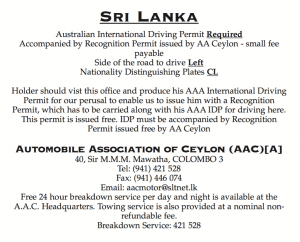 If I were to choose option 1, can i get the relevant document ready on the same day from the AA of Ceylon? Hey Andrew, thanks for the question! Yes you can get it on the same day. Just bring the copy of your IDP into the AAC and they will issue it. We usually get this sorted for our customers before they arrive (though I note you are going the motorcycle option). It takes anywhere from 5 minutes to 1hr depending on how busy it is! Good luck and we hope you enjoy your trip around Sri Lanka! Thanks, Tom. My home-country driving license is just for car (type B). Could I apply option 2 ? we are looking at picking up a tuk tuk in Ella. We will have an IDP before coming over, however will not be in Columbo to visit the AAC. Will the first option allow us to have the Sri Lankan license before we arrive and pick it up in Ella? Absolutely. If you book with us, we’ll organise your licence before you arrive and deliver it to Ella with your tuktuk! Some has said Sri Lanka Motor Traffic Department as efficient as it can be. Last year I was in Sri Lanka without the IDP and the car rental agency sent me with their driver to Werahara to get this permit. It took me the whole day, file getting from one officer to the other. Then the lunch break came and most of them had gone on a staggered arrangement. So when you got one signature, I have to wait for the guy who has gone for lunch. When he comes the other one is missing. However, I was wasting my time from 9:30 until 2:30 when I got the paper. Of course travelling to Werahara is another 2 hours up and down. So if you are travelling to Colombo from overseas without harping about a few rupees get your IDP before you travel. Hi I am Shree from India, I have an IDP and Driving License issued in India. I heard that people of SAARC countries need not get AAC endorsement on their IDP. Is it true? or getting AAC endorsement on IDP is mandatory to ride in Sri lanka..? I will be visiting Sri Lanka for only 9 days. Please help me. Thanks in advance ! Sri, If you have an IDP from India just go to Automobile Association of Sri Lanka near Galle Face and get the authorization In 10 minutes. Take your passport also with you just in case to prove your visit is valid. Unfortunately, the answer is yes. Sri Lanka is one of the few countries that requires all foreign drivers to have local endorsement. Fortunately, having an IDP is by far the easiest way to make this happen. Happy travels in Sri Lanka! So as per the above Srilankans too should obtain the IDP in local before proceeding to a foreign country? No, it’s just for foreigners wanting to drive in Sri Lanka. Sri Lankan’s driving abroad will need to follow the local laws in that country. Is it possible for u to obtain the Sri Lankan driving permit in advance and deliver it to me along with car if I book a car for a week with u and send u the IDP obtained from India on 11th of this month….if so let me know at the earliest…..
Our apologies for the late reply, we have been busy with the Tuktuk Tournament so a bit behind on replying on our posts. But we can get you a Sri Lankan driving permit in advance if you send us a copy of your IDP. Feel free to send us an email if you have any more questions! I am living in India without a international driving license just about to travel to Sri Lanka. I am there only 10 days and have already paid the hire car company to rent a car. it was just by chance that I saw you needed a permit, which you don’t need in India. Would it be possible to get an international licence from the UK sent here within a week of travel. Because I don’t think option 2 is an option with that amount of travelling to get a permit. I could just cancel the car and hire a driver. Please help. Not sure if the UK issues IDL and sends it overseas. But check out this website which could be of help: https://idaoffice.org. You will still need to get the permit after you receive the IDL. can I ask you: I heard it is possible to get a SL driver License at the airport (when arriving). Do you know that and if so, where to do it and is the ‘2-option’ (regular driving lic change to SL license) possible there? Hello, I am a little confused – in official website of DMT are conditions to Conversion of Foreign License. There’s written that you need a Medical fitness certificate obtained from the National Transport Medical Institute, within a period of six months. What is it? Do I really need it? 2nd question – I have license for A1, B and B1 in Czech republic. I am planning to travel around the whole Srí lanka. What’s the best choice to rent? I was thinking about motorcycle, but then I found your web with tuktuks. I am a little afraid that tuktuk can’t get everywhere – especially in the mountains…What do you think? Hi Nina, thanks for your message. If you can send us an email with your questions, we can answer all your questions specifically there. Not for the license. However when renting a tuktuk we can have your license ready on arrival! I want to drive legally in Sri Lanka. I have an IDP from the US. I am currently in the Galle area and do not want to make a trip back to Colombo just for this. Is there a way to obtain the permit down South? When you rent a tuktuk from us, the driving instructor will take your Sri Lankan license with them down to Galle. What are talking. Colombo is only 1 hour away. Only authority to certify your IDP is SLAA. Once they certify you could walk into any rental agency and rent a car. Mind you rental price does include insurance. Compared to US it is a steal in Sri Lanka. Last December when I was in Sri Lanka I was at a rental place to rent a car. He read my IDP and said Sri Lanka is included in the driving permit and I do not need any other documents. First see whether your IDP covers Sri Lanka in the list of countries listed. 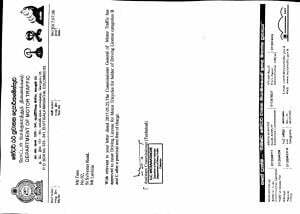 Then you do not need any other documents. Hello, I’m planning on staying in Sri Lanka for 6 months. Having travelled there before I’ve always had problems with driving license. I have an IDP but I don’t actually have a motorbike license which is what I tend to use when I’m there. Do you know of any options for foreigners to get a bike license in Sri Lanka? Any help much appreciated! I moved from Germany to Sri Lanka and have a residence visa now. I don’t have an IDP, just my normal German driving licence. How can I get a local driving licence permamently, what does it require? It seems, from what I have read so far and heard from friends, that it is very easy to get the driving licence translated but it seems complicated to get a permanent one. Thank you! Hi Jamie, sorry for the late reply. Unfortunately in order to get the permit, you do need a licence. Driving around without the proper paperwork will result in fines and not being able to continue your journey. Hello, please, could you help me? I arrived to Sri Lanka one year ago and I’ll stay here for a while. I’ve my spanish driving licence B and also the IDP. I’d like to drive a tuk, tuk here. What shall I do? What’s the easiest procediment and what’s the cheapest? I’ve residence VISA. Happy driving! Make sure to stop by our office in Mt Lavinia to say hello! If I can get IDP from UK and send a copy to you, would you be able to get me a license for when I arrive in December? Hi Sana, if you make a booking with us through our online reservation system. We can have it all ready for you! Hi, I have a UK Full motorcycle licence (including anything with 3 wheels). Is it true then that I can’t get a tuktuk licence in Sri Lanka despite being legally qualified to drive one everywhere else. This is important for me since I will be living here for at least a year on a working residence permit and need a vehicle to go surfing. Since they put the stupid ban on motorcycle board racks it’s either a 3wheeler or just riding a bike with my board bag over my shoulder (not ideal)…. You can’t drive any vehicle in Sri Lanka without a local endorsement. You will be able to drive a tuktuk, you just need to make sure you get the right endorsement. Read the article above for your options on how to do it. Please do not leave your own country without IDP. If your IDP have an endorsement to cover Sri Lanka you do not need any more endorsements. I am a British, holder of British driving licence and have airplane also. Still I need to endorse in Srilanka, before drive? I am arriving to colombo on friday night, and would like to apply for temporary driving license. But since the departments will be closed, can it be done through any agents?? if so, whom should i contact? Don’t know of any agents, sorry. What you can do, is book a tuktuk and we will arrange the licence for you! big compliment for all your replies above. Really helping people out here. I already have my IDP. Do you think it would be possible if a friend of mine (who already is in Sri Lanka before) could take the hardcopy of my IDP, a copy of my passport (since I will only arrive with my hardcopy) and a copy of my visa? Will the agents be willing to give the permit if she has ‘only’ a copy of my passport. I could also give her my national passport as an assurance. Perfect! This makes life so much more easier. Thank you for your oh so quick reply. You guys rock! Hi, does anyone have experience with getting an IDL online and being accepted / recognized by the Sri Lankan authorities? Getting an IDL in my country is prohibitively expensive and I’m very tempted by the online option but I wouldn’t want to throw money away. Thanks! I don’t have the srilankan license though I’m a srilankan but I do have the u.a.e automatic driving license . Is it possible to exchange with permanent srilankan manual and auto license? Hi Ashkar, I would advise getting an International Driving Permit from UAE. Which you then can use to get your temporary Sri Lankan driving permit.